After the emotional gut punch that was the Krell arc, one might have expected The Clone Wars to follow those episodes with a bit lighter fare, such as the Threepio/Artoo two-parter that preceded them, but instead the show continues to plunge the darker depths of the Star Wars universe, here telling a similarly, brilliantly troubling tale of corruption and greed, though one with an ultimately more optimistic conclusion. This trilogy of episodes concerns Anakin, Ahsoka, and Obi-Wan’s attempts to free a peaceful, artisan colony of Ahsoka’s people–the Togrutans–from enslavement at the hands of the Zygerrians, a former slave empire whose power had been stripped by the Jedi in years past but who are now once again attempting to rebuild what they lost, with the help of Dooku and the Separatists. Anakin is, of course, the perfect character that the writers could have chosen to be confronted with evil slavers, as it hits closer to home for him than possibly any other conceivable crime a baddie could be doing. As we know, not only was he born into slavery but his mother, only years after having been freed, was captured again and ultimately killed by Tuskan raiders on Tattooine. If the show had ever brought up that specific aspect of his past, however–not just his mother or her death, but the fact that she and he were slaves–it hadn’t been in a long time and never so prominently, creating yet another example of Clone Wars writers using the fictional universe and history of the films intelligently in order to inform the characters’ actions in the present day of the series. It is something that fills him with so much anger that it provokes him for the second time in the series into using the Force-choke on another living being, this time the Zygerrian queen, who had at that point captured his friends. The Queen is, in many ways, a monstrous person. She thrives on power, and the way she derives it is to crush the spirits of those she considers weaker than her. At the same time, she has a certain sense of honor, within her code. When she promises Anakin that, if he agrees to stay by her side, she will let his friends go, one does tend to believe that she’s telling the truth. She also speaks remarkably perceptive, prescient truths to Anakin. She tells him that, as strong as he is, he is a slave as well–to the Jedi, to the Republic, to the people to whom he has committed himself–and while her world view is certainly deeply warped, there is an eerie resonance to the fact that it is precisely Anakin’s overwhelming commitment that will ironically drive him to the Dark Side, where he will spend all but the last few moments of his life being a slave both to his own darkness and to Palpatine. 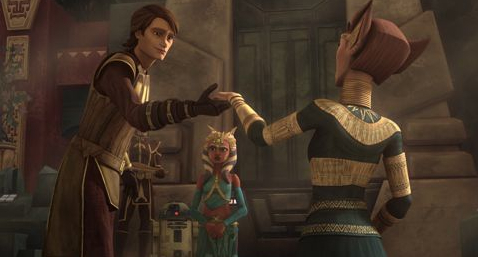 What the arrogant Queen doesn’t realize–and which Anakin tries to tell her–is that she is a slave, as well. In allying herself with Dooku in order to regain her lost empire, she has actually turned herself into his property who Dooku will ultimately kill with his own Force choke when she attempts to stand up to him. It is to the show’s credit that, rather than painting her as a one-dimensional villain, it makes her death a fairly sympathetic one and gives her a final moment of decency in telling Anakin where Obi-Wan is, right before she expires. That isn’t to say that one should ever go so far as to like her. After all, she had sent Obi-Wan to do backbreaking labor in a hellish mine and–with the specific purpose of destroying his spirit–had ordered her guards to punish a different prisoner whenever he defied their authority in any small way. As a Jedi and a human being, it is Obi-Wan’s nature to attempt to help those in danger, and yet any time he makes a motion to stand up for them, they are hurt even worse. In these scenes, the show never shies away from portraying the degradation and misery of slavery. One can easily imagine that years, or even months, of such treatment might eventually cause Obi-Wan to lose all hope and to lose himself. Luckily, however, that doesn’t happen, thanks to Anakin and Ahsoka, who saves the lives of many slaves through her own creativity in an otherwise extremely dire situation. Incidentally, I also loved the visual reference to Return of the Jedi, when Artoo first attempts to help Anakin and Obi-Wan by tossing them their lightsabers from his inner compartments, just as he will do for Luke at Jabba’s palace, where, significantly, Leia was being held as a slave, as well.